From a simple vinaigrette with parsley to a lemony mayonnaise, here are 9 great sauces to pair with roasted fish. 1. Mediterranean salsa verde. Like pesto but punchier, this vinegar-spiked, infinitely variable herb sauce is delicious with almost any kind of fish. 2. Orange-fennel. Marinate fillets in a mixture of fresh orange juice and fennel seeds, which will then become a delicate sauce after the fish roasts. 3. Simple vinaigrette. The flavors of classic vinaigrette, like this one made with parsley or this one with lemon, pair nicely with simply roasted whole fish. 4. Lemony mayonnaise. If you’re a fan of tartare sauce, make this cornichon mayonnaise to serve with any roasted fish, or blend mayo with preserved lemon for an even simpler sauce. 5. Salads. 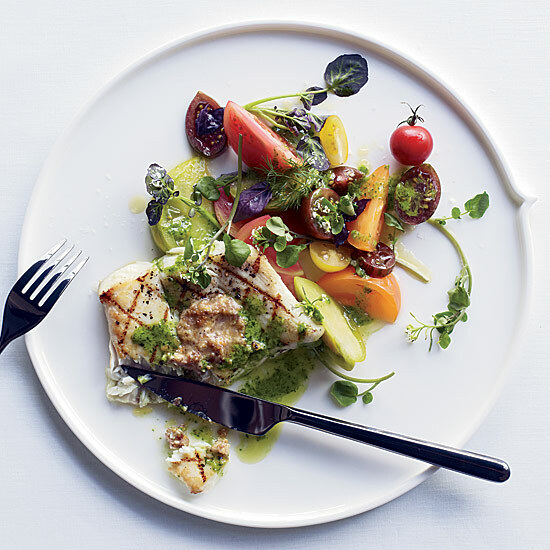 Instead of a sauce, top fish with a bright, punchy salad made with celery leaves, parsley and tarragon or a Greek-style salad with tomatoes, cucumbers and feta. 6. Horseradish cream. Strong-flavored fish, like salmon or bluefish, are terrific with a spicy blend of heavy cream and prepared horseradish, especially in cooler weather. 7. Flavored butters. You can blend almost anything into butter to serve over hot roast fish. Keep it simple with citrus zest and herbs, or make something chaffier, like this blend of butter, juniper berries, orange zest, Serrano ham, lime juice and fennel pollen. 8. Salsa. The 1990s are back in your closet, so why not on your table? Make a chunky fruit salsa—not just to be trendy, but because it’s delicious with roasted fish. 9. Charmoula. People are obsessed with harissa, that North African spice paste. Now it’s time to get to know charmoula, a lemony, spiced, oil-based sauce that’s also blended with herbs. Use it to roast fish and then serve more on the side.